Unapologetically Female: White guys, white guys, white guys. Even though I agree with the feminist critiques of late-night TV, we still DVRed and The Tonight Show all this week, because the drama ended up making for some really interesting television and provided endless fodder for good comedy. Not only were the jokes especially funny, but Conan made a big deal about all of the amazing guests who were coming on the show in what might be (and was eventually confirmed to be) its last week on the air. As we watched it night after night, I couldn't help but notice a pattern in these guests. That's right. With the exception of a Cirque du Soleil performer (who didn't speak) and Joss Stone (who also just performed), it was white guys, white guys, white guys. 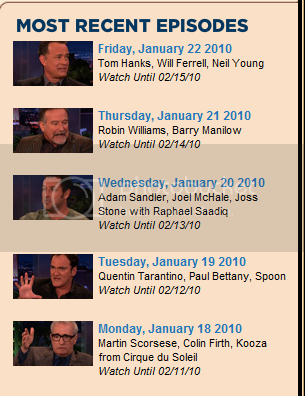 Doesn't do much to trouble the stereotype of the late night TV boys club, huh? Kamran read something about Conan spending over a million dollars on a one-minute sketch the other night just to stick it to the man, which pleased me greatly. I LOVELOVELOVE how you point out all these things that I would never, ever notice on my own. It's slowly but surely making me much more observant.